Plug-ins can add new menus and menu items. For example when the java editor is open you will see the Source menu and when the XML editor is open, you will see the Design menu. The File menu allows you to open files for editing, close editors, save editor content and rename files. Among the other things, it also allows you to import and export workspace content and shutdown Eclipse. The Edit menu presents items like copy & paste. The Source menu is visible only when a java editor is open. It presents a number of useful menu items related to editing java source code. The Navigate menu allows you to quickly locate resources and navigate to them. The Search menu presents items that allow you to search the workspace for files that contain specific data. The menu items related to building a project can be found on the Project menu. The menu items on the Run menu allow you to start a program in the run mode or debug mode. It also presents menu items that allow you to debug the code. The Window menu allows you to open and close views and perspectives. It also allows you to bring up the Preferences dialog. The Help menu can be used to bring up the Help window, Eclipse Marketplace view or Install new plug-ins. The about Eclipse menu item gives you version information. 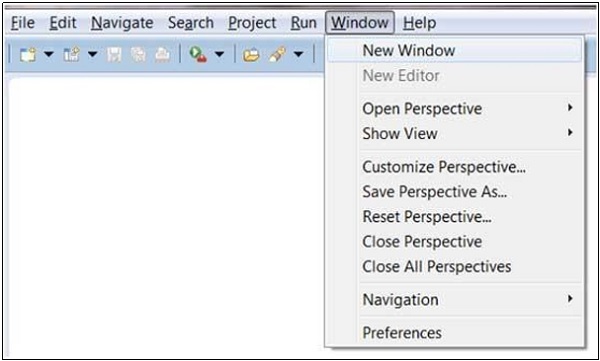 The visible menu items on a menu depend on the installed plug-ins and customization done using the Customize Perspectivedialog box.